Local NBC affiliate WOOD reported on Monday that the Grand Rapids Police Department had formally begun an internal investigation stemming from an incident earlier this month when 11-year-old Honestie Hodges was held at gunpoint by cops, handcuffed, and shoved into the back of a police cruiser. On December 6, Hodges, who is black, was reportedly heading out of her home through its back door to go to the store when she was intercepted by cops, who were searching for Hodges’ aunt, Carrie Manning. Manning, a 40-year-old white woman, was wanted for allegedly stabbing her little sister a few blocks away, and was believed to be armed. At the time, the cops’ baffling excuse for arresting Hodges alongside her aunt was that they couldn’t rule out the possibility that she was a suspect and also armed. Hodges says that she is now terrified to go near the back door of her own home. She also no longer wants to grow up to be a cop. “I wanted to be a detective or police officer, but now I don’t want anything to do with those kind of things,” she said. 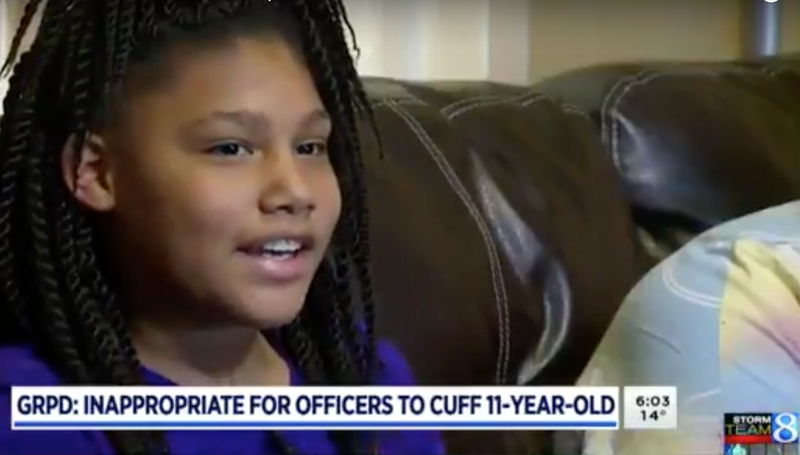 This week, the GRPD released a 45-second clip of an officer’s body camera footage documenting the arrest, which shows that a cop pointed a gun at Hodges as she was handcuffed in front of her mother, who plead that her daughter is only 11 years old. Perhaps the most disturbing part is Hodges’ terrified screaming as she was asked to put her hands behind her back.